Let me start off by saying that never considered myself a "two-tone" kind of guy. There was always something so "mature" about wearing a two-toned watch that I always ignored them. Not anymore! 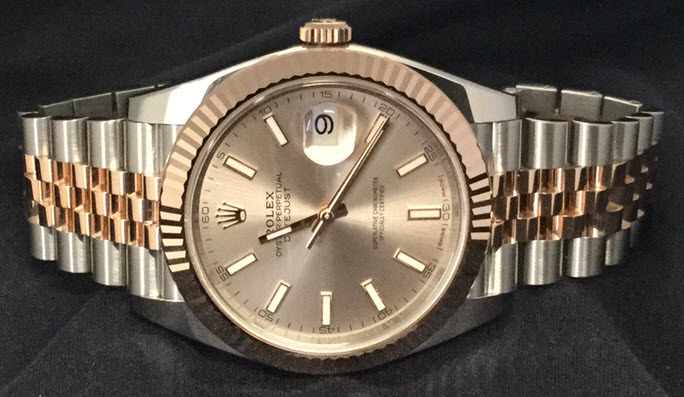 This re-worked version of the Datejust 2 just seemed to hypnotize me. 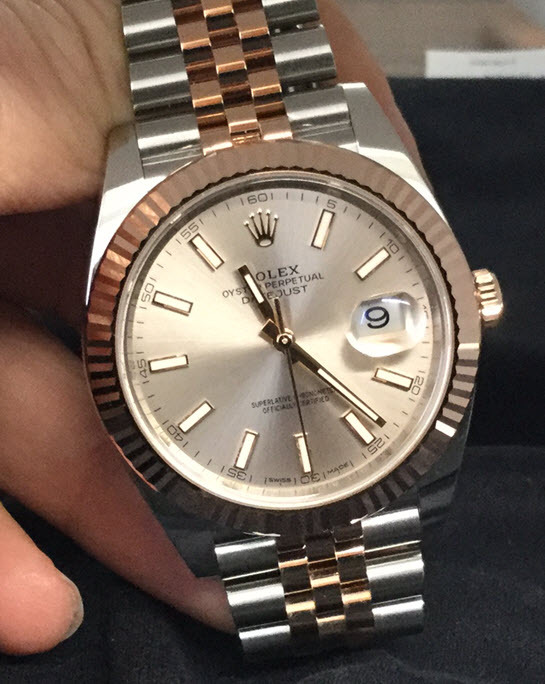 Maybe it was the combination of the steel with the very warm everose/rose gold, maybe it was the jubilee bracelet, maybe it was the proportions and slimmer case or maybe it was the harmonious blend of all these elements but after sliding this onto my wrist I was sold! Some quick shots with my I-Phone which don't do justice at all. 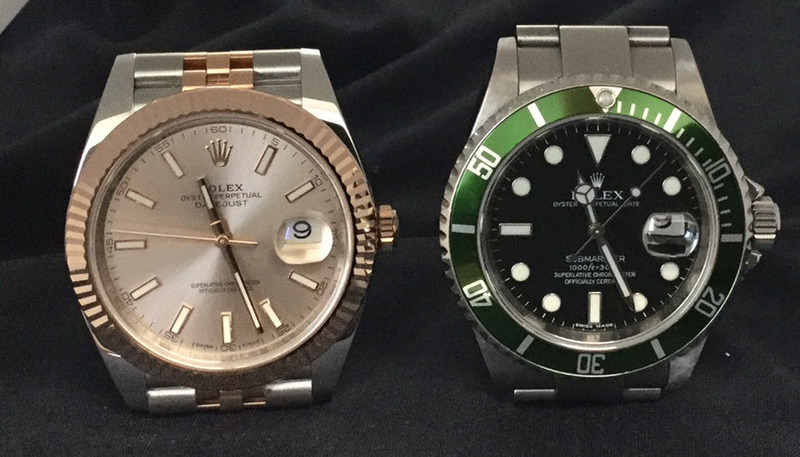 Rolex refers to the dial as "Sundust" which changes in various lighting from a light copper to a shade of ivory with alternating colors in between. Here is a side view of the jubilee bracelet with the clasp. The bracelet itself is truly comfortable and representative of the jubilee bracelets of old with some improvements. The bracelet's fit to the case between the lugs is much better than in the past and was well thought out. There has been a lot written about the fact that Rolex erred by not offering a hidden clasp. At first this was a minor turnoff but easily overlooked once it sunk in that the 5mm extension link that folds out from under the clasp is a real plus. But vs. a hidden clasp, it will certainly scratch a bit. To give the watch some perspective, I placed it next to my Rolex Sub and you can see that their case sizes are comparable. While this is certainly a sports watch with versatility to go casual and dressy, on the wrist it definitely swings more to the dressy side! 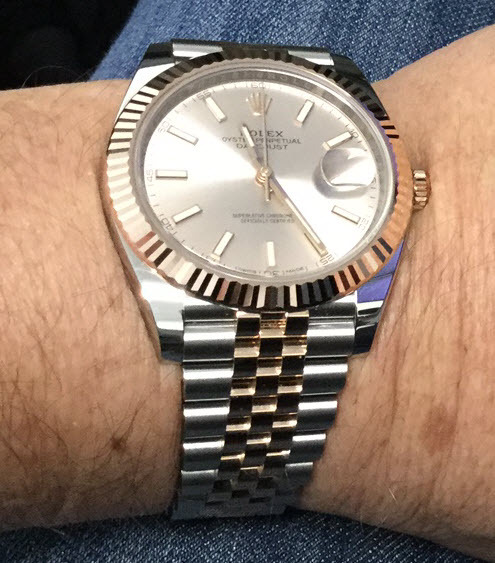 Previous Topic: Who else is wearing a Rolex this weekend? Next Topic: Dare I ask you Rolex connoisseurs a question?